Booties come in many different styles and colors, so it’s easy to find the right ones just for you. There are lace-up, sock, brocade, fold-over, flat heel, high heel, pointy-toe, round toe, metallic, fabric and animal print booties to choose from. One of my favorite ways to wear a pointy-toe ankle boot is with a dress or skirt. Pointy-toe booties give a feminine, dressier touch. 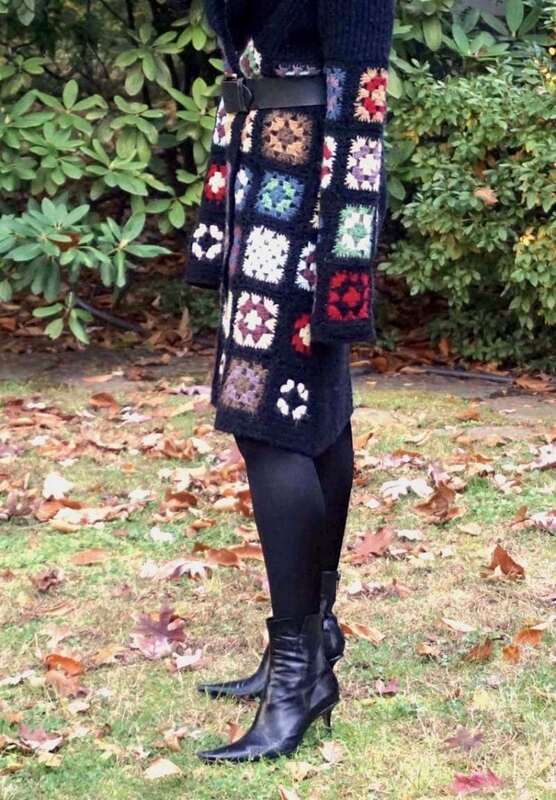 As you can see above, I belted an oversized patchwork sweater dress and paired it with black tights and black, pointy-toe ankle boots. This all black leg makes for a chic look that elongates your legs. 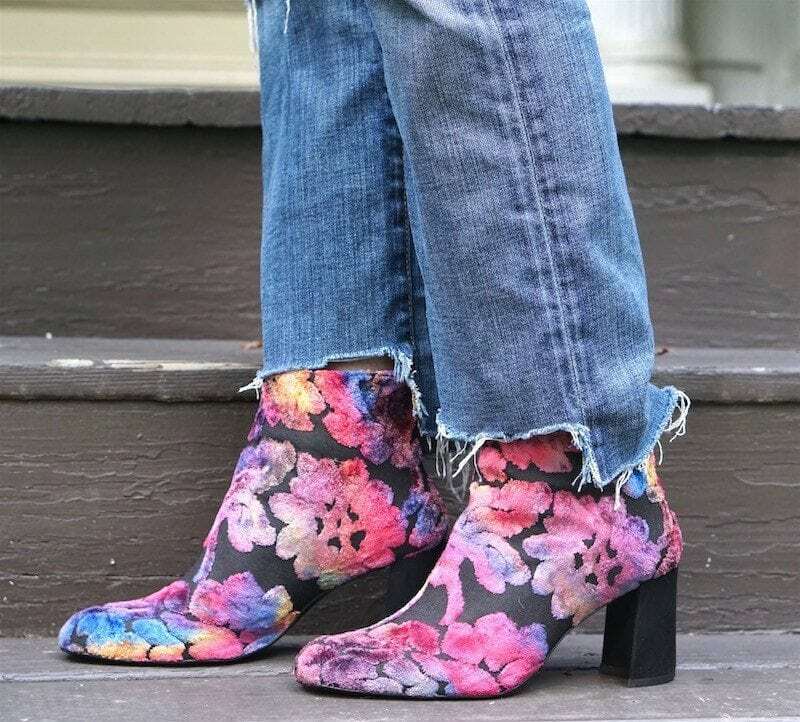 A statement bootie, like these colorful brocade ones, are great with distressed jeans and an oversized leather coat. These boots make the whole look. A rounded toe and chunky heel give this ensemble a casual and comfortable feel. The most flattering style of ankle boot–for everyone–is when the top of the boot hits just above the ankle and are wider than your legs, like these brocade ones. Keep this in mind to avoid the dreaded “stumpy look,” which is my fear when wearing ankle boots. A cropped pant is the perfect item to wear to show off your booties, like these camel, pointy-toe booties. Boots can be dressed up or down. These camel colored, ankle boots are the same boots in the above photos. Worn with cropped off-white pants they have one feel, but when paired with boyfriend jeans they give an entirely fresh look. These brown ankle booties are my go-to everyday boots because of their low heels. They are so comfortable, but add that extra stylish touch. If you don’t have a pair, You Gotta Get The Boot. You’ll find yourself reaching for them all the time. They’re the perfect fall/winter staple to add to your wardrobe. Me too Hilda! But, I’m enjoying my ankle boots this season so much more! I love this article, love every single pair of booties! 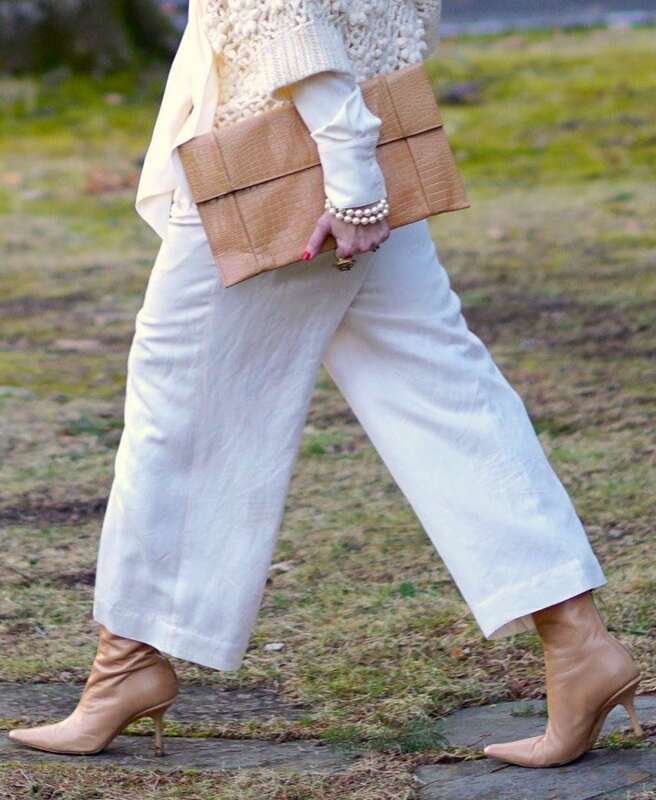 I’m always inspired by your Fashion Friday posts (especially your photos!) and you’ve motivated me to edit my closet (yet again) and make a short-list to go shopping! Thank you and I’m so glad that I have inspired you Donna, that means so much to me. What’s on your shopping list? YOU ARE ROCKING THOSE BOOTIES!!!!!!! I learned on INSIDE OUTSIDE blog that my shoes make me CREATIVE and OH GOSH can’t recall the other word………!!!!!!!!! ANYHOW…..short boots are ADORABLE just like YOU! Outfit number one is very much my go-to. I’m a huge ankle boot fan…in fact, I just ordered another pair last night: The Naturalizer “Daley.” Can’t wait til they arrive. 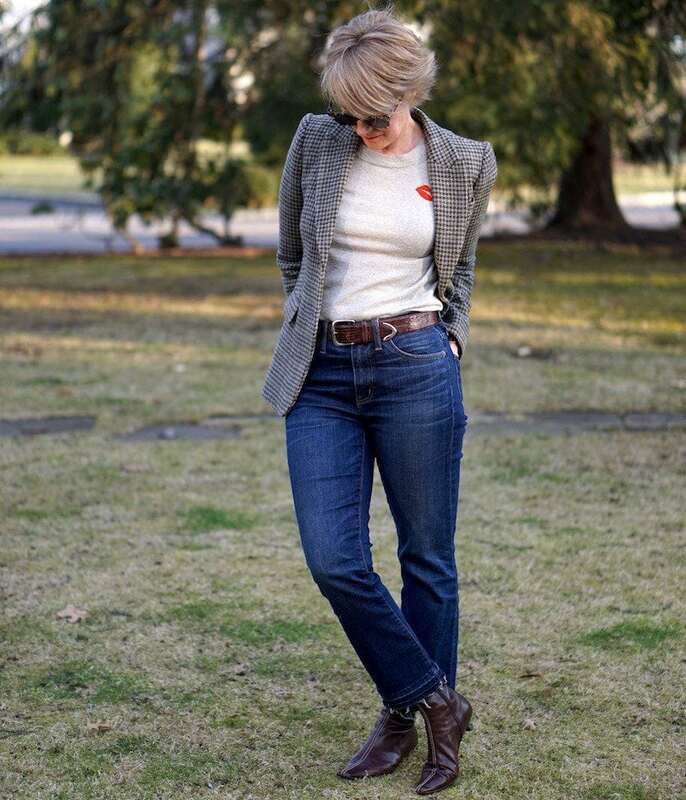 The taller height is perfect for bridging the gap so that skin doesn’t show below the hem of my cropped jeans. Yes, that is a great point, I really don’t like when my skin shows in between top of boot and pant. I am going to check out the Naturalizer “Daley” , thank you! Love all the looks! Oh Miss Cherie James, you hit it out of the park! Every ensemble and every boot style is so fab! You are a doll Jill, thank you! I love all boots but the ankle boots are so chic. 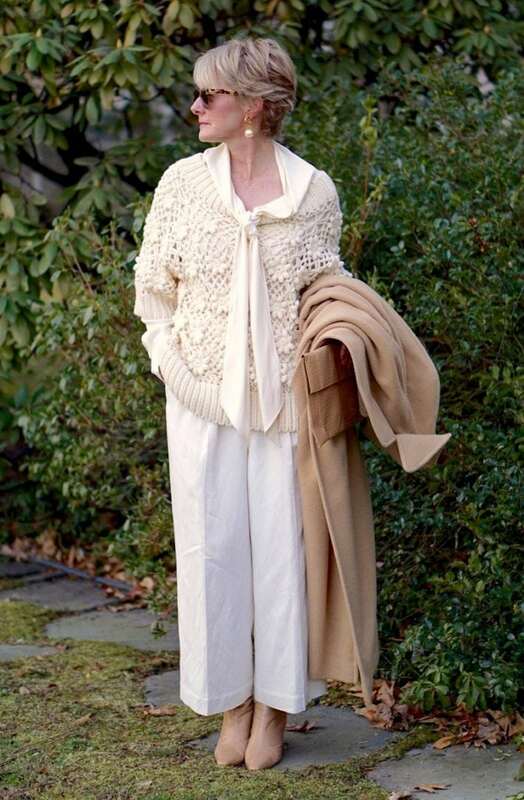 Love the look of the tan with the winter white outfit…stunning! Happy Wednesday! That is my favorite look as well, so soft and easy on the eyes, thank you! Last Week to Win Makeup Wakeup!